On the GT6's with Rotoflex suspension the shock mounts are normally welded onto the inside of the wheel wells. While this is ok for most street purposes, the shock mounts are not really strong enough for racing. What's more, the stock mounts restrict the size of tire that can be used, because extremely wide tires will rub against the shock absorber. So, I have designed two different brackets to solve the problem. 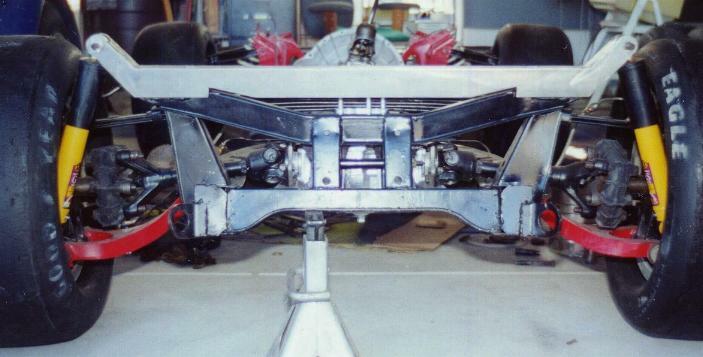 The first is a "Race Only" bracket that requires some cutting of the inside bodywork in order to fit the body over the bracket. The other is a more modest design that still attaches to the frame but does not require as much cutting and ends up being in approximately the same place as the stock bracket, but because it doesn't attach to the fender well, it is much stronger. The very bottom of the inside fender well requires trimming so that it fits over the "street" bracket. This modification is not outwardly visible and does not interfere with the inside of the trunk area. GT6's need to have the old bracket and reenforcement plate removed for clearance. This product is no longer being manufactured due to the increased costs of steel and the number that have to be made in order to be affordable. However, anyone who wants to make their own should contact me at spitlist@cox.net. I will send the engineering drawings free of charge. This photo illustrates the Street shock mount. I t will accommodate most street tires that can normally be mounted on a GT6. The brackets are reinforced 3/16" mild steel and have mounting holes topside to accept the standard body mount bolts and install on top of the rear body pads. The photo at the left illustrates the cutouts that allow the bracket to fit right over the stock body mount pedestals without requiring any modification. This applies to both designs. 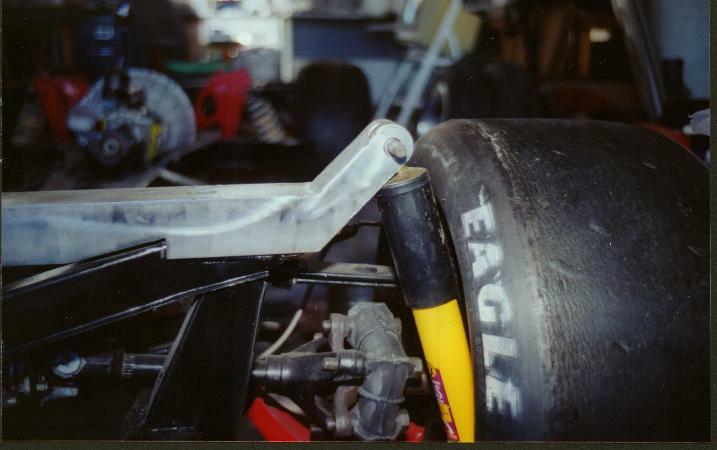 The Race Only bracket provides critical clearance for large tires as is shown here with about 1/2 inch clearance at the top. The shocks illustrated are SPAX and have rubber dust boots on the top of the shock. This provides an additional measure of comfort knowing that if the tire does get closer to the shock it will only be rubbing on the rubber boot. Both brackets are constructed of 3/16" mild steel and are both priced at $90 (US). A shipping charge of $20.00 will deliver the mounts anywhere in the continental US. Shipping outside the Contiguous 48 states will be higher and will depend entirely on the destination. Note: A recent increase in transportation costs have forced the shipping charge to be increased, but the previous cost of the unit itself remains unchanged.